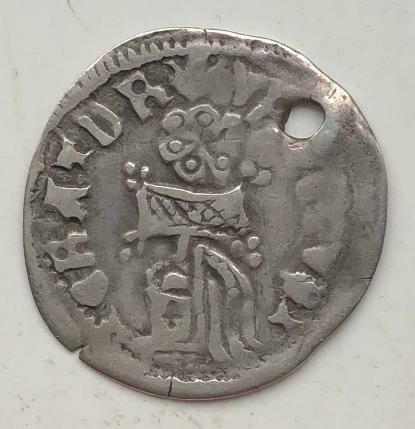 Comment: Stefan Uros V silver coin with Serbian and Latin languages used in description, holed with sigla 6 on the obverse right side. Reverse helmet is facing left. Comment: Rare type that apparently combines the designs and legends from the previous reign of his father Dusan. Both Uros V and his father Dusan bore the royal names Stefan and Uros. The reverse legend 'IPR ROI' hints at the Latin "Emperor of the Romans" used on some early Dusan coins. Reverse: Ornamented helmet, Latin legend: IPOV - IVPO. Comment: Stefan Uroš V was the only son of Stefan Uroš IV Dušan by Helena of Bulgaria, the sister of Ivan Alexander of Bulgaria. He had been crowned as king (second highest title) in the capacity of heir and co-ruler after Dušan was crowned emperor in 1346. Another horse helmet combination with uncertain legend. Comment: Stefan Uroš V died childless in December 1371, after much of the Serbian nobility had been destroyed by the Turks in the Battle of Maritsa earlier that year. The exact cause of his death at a relatively young age remains unknown. Vukašin's son Prince Marko inherited his father's royal title, but real power in northern Serbia was held by Lazar Hrebeljanović. 3rd horse variation but with double struck Jesus bust on reverse. Comment: 4th horse variation again with Jesus bust on reverse. Comment: Wife of Uros V was Anna of Wallachia was one of the daughters of Nicolae Alexandru, Prince of Wallachia and wife of the Serbian Emperor Stefan Uroš V. Her sister, Anna, was the wife of Bulgarian Emperor Ivan Stratsimir. She most likely married Uroš in the summer of 1360. She took monastic vows, becoming a nun, and adopted the name Jelena. A scarcer but crude issue of imperial couple from the troubled times of the Serbian Empire. Comment: Another scarcer but crude issue of the imperial couple from the troubled times of the Serbian Empire. Comment: This and next example are same with a suttle difference of helmet pointing to the right where next one below helmet points to the left. Comment: Uros V got defeated, captured and imprisoned after the battle of Kosovo Plane in 1369. He died at the age of just 35 on December 4th 1371. His remains are kept today in the Congregation Church in the capital city Belgrade. Comment: Because of similarity with the coins of Duke Lazar many numismatists attribute this coin to Lazar. 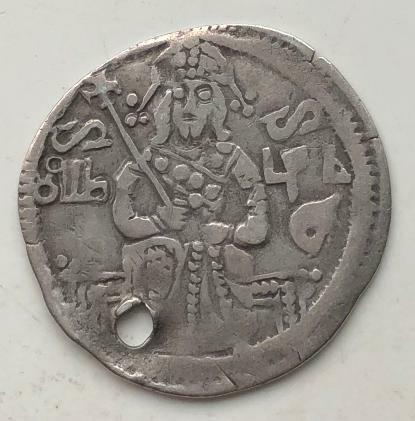 What makes this coin special is the fact that belonged to Jovanovic himself and picture of it is in his book Serbien Medieval Coins Belgrade 2002 issue page 55 number 29. Please see below. It was sold by his widow after his death.